DAOSTORM can analyse localization-based super-resolution imaging data at densities 6x higher than previous algorithms. The source code of the latest version (June 2013) and a list of changes can be downloaded here from Seamus Holden's website. For further details, please see the Nature Methods website. We have written a TIRF-FRET analysis package for the automatic analysis of single-molecule FRET movies. TwoTone is written by Seamus J Holden, Oliver J Britton and Stephan Uphoff, in association with our recent paper on TIRF-FRET measurement and data analysis. 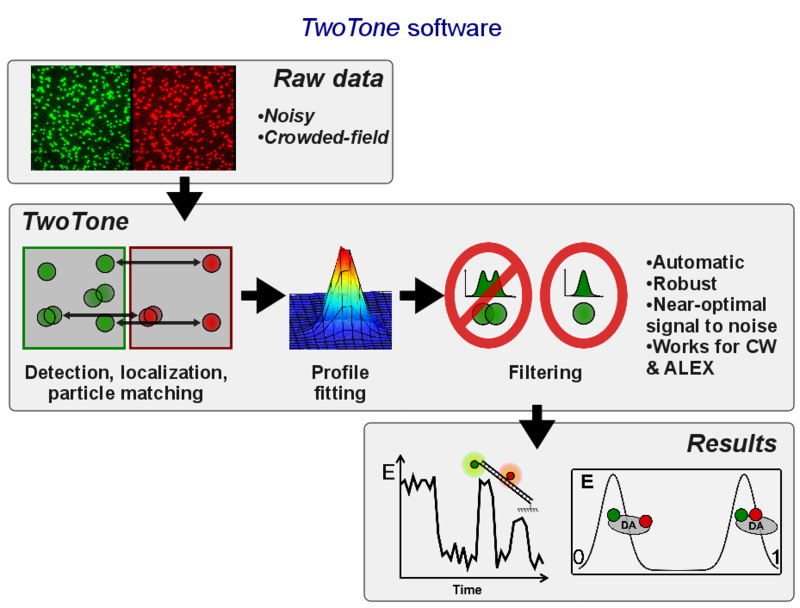 TwoTone is written in a combination of MATLAB and C++, works on Windows and Linux, and is distributed with complete source code. twotone3.1ReleaseBundle.zip - The main TwoTone package. Academic or personal use is free. For enquiries regarding commercial use, please contact innovation@isis.ox.ac.uk quoting reference 7672. Please read and accept the TwoTone license before using the package. gaussFitTools1.0Release.zip - Fast Gaussian PSF fitting library. We recommend you download and install this software alongside your standard TwoTone install, as it significantly increases analysis speed. This software is licensed under the GNU GPL. twotonetestfiles.zip - Some ALEX TIRF-FRET data with which to test TwoTone. If you use our software and have found it useful please send us an email, with "<Software Name> Registration" in the title (eg. substituting <Software Name> for TwoTone or DAOSTORM). This helps us to track usage and popularity of the software. If you use our software in work leading to a publication, please cite the relevant publication associated with our software.